Convenience and affordability are the key values to consider when assessing a customer service experience. And what can be more convenient than being able to solve all your financial needs in one place, at affordable prices? MAS Financial Services is a single-source financial services provider. This means that they provide a broad range of services to meet all your financial needs no matter what your credit record. All you need to do is visit their website and upload a copy of your ID, latest payslip, proof of residence and three months’ bank statements to be considered for one of their excellent services. MAS Financial Services’ bridging finance solutions are custom-designed for industrious individuals, homeowners, businesses and property developers. With this service, MAS will collect your details and pass them on to approved and recommended bridge finance specialists in your area who will contact you with their best offer. Bridge finance extends to capital for inventory, renovation, equipment or taxes as well as arranging mortgage bonds, property loans, property development finance and a range of other financial services in the commercial property sector. One of these services that MAS Financial Services specialises in is bonds. They have a team of experienced property finance consultants to guide you through the confusing and often overwhelming task of securing finance for your home. They offer competitive interest rates and treat you like the individual you are, not just another application in a pile. Each application is carefully assessed for suitability and all circumstances are taken into consideration when final approval is being decided. MAS Financial Services carefully assesses each applicant because they understand that people are not defined by their past transgressions. A few misguided financial decisions can have a lasting impact on your future, but MAS Financial Services can help you clear your bad credit rating with the ITC and get you access to loans and credit facilities. One of the many ways MAS Financial Services helps you clear your bad credit rating is by providing debt consolidation loans so that you can settle all your current debt and focus on one monthly repayment arranged to suit your budget. 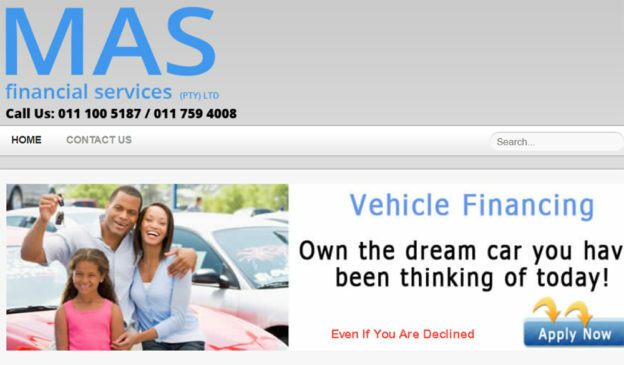 MAS Financial Services offer vehicle finance to people with a bad credit record, no credit record, and those who are self-employed. They also offer car lease options at the best prices. All you need is a valid driver’s licence, a valid SA ID, your last three months’ bank statements, proof of income, proof of current address, a clear criminal record and a deposit available. For more information about how you qualify for these services, call their offices in Johannesburg on 011 100 5187 / 011 759 4008 / mariangel.feinberg@masfinancialservices.co.za / masfinancialservices@live.co.za.